Used to line consoles, cup holders, and various interior bins. Provides anti-rattle, squeak reduction and cushioning. 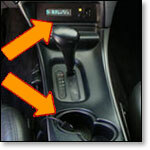 PVC Foam tape provides a cushioned seal around cup holders, bins and automotive consoles. PVC Foam tape provides an air and watertight seal and retains durability and compression recovery through repeated use. Inherent fire retardency and UV (ultra-violet light) resistance makes it a superior sealing tape. Self adhered console liner tape with an easy to peel liner that is cast onto the foam rather than the adhesive. Simply unwind to expose the adhesive side and apply gentle pressure to stick. Acrylic adhesive can take up to 72 hours to achieve maximum bonding.